Thanks for a Great TOV! Support SVC Every Time You Shop! Monday Night Mountain Biking Returns July 2nd! Thank you for another successful Cowboy Breakfast! BDOG Celebration Concert for Youth Education and Nature! Let Us Double Your Donation for Open Space! Shop as Usual and Support Open Space! Great Scott Road Bike Day, Sun. May 3, Wildflowers Without Traffic! IMBA presents - "Better Living Through Trails" and partners with SVC and Murieta Trail Stewardship in Rancho Murieta. The Sacramento Valley Conservancy is in the running for the Sacramento Natural Food Co-op's Make Every Day Earth Day bag token program. The Sacramento Valley Conservancy is in the running for Sacramento Natural Food Co-op's Make Every Day Earth Day bag token program. Vote to support SVC! Voting begins on Monday, April 15 and ends on Earth Day Monday, April 22. Voting will take place inside the Co-op and is open to all Co-op shoppers (ballot box will be at the Demo Center between the Produce, Bulk and Wellness departments). Every time Co-op shoppers bring in a reusable bag for their groceries, the Co-op donates five cents to environmental groups. Shoppers can choose between five different groups and vote on new groups each Earth Day. Join us as we celebrate Earth Day at the Sacramento Natural Foods Co-op on Saturday April 20th. Stop by the SVC table to learn about SVC's upcoming events, test your leave no trace knowledge and enter to win an SVC swag bag. In 2018 the Sacramento Natural Food Co-op donated $20,690 in the Co-op's Make Every Day Earth Day bag token program. Our community made a huge difference for local non-profit environmental organizations. Thank you for your support! We need a Tiny House for Camp Pollock's dedicated live-on-site caretaker to maintain this beautiful, historic 11-acre property as a safe and enjoyable space for the community. Located in the heart of the American River Parkway, Camp Pollock is one of the only safe spaces open to the public daily from sunrise to sunset with river access and no charge to park. The Sacramento Valley Conservancy (SVC) manages this 11-acre property with no dedicated public funding. The grounds are maintained by a live-on-site caretaker and hundreds of volunteers. Our caretaker currently lives in a rusty old trailer, and due to seasonal flooding of the Parkway, has to be ready to evacuate the property within 24 hours notice. A Tiny House is vital for SVC to continue having an on-site caretaker, and will also further our efforts to reduce our carbon footprint. Each year, Camp Pollock hosts more than 7,000 annual visitors, approximately 2,000 of which are under-served minors as part of our Youth Education and Stewardship (YES!) program. SVC promotes outdoor recreation, environmental education, energy efficiency, and Leave No Trace ethics. Camp Pollock is a historic Boy Scout property from the 1920s. SVC continues their traditions by being an outdoor classroom; and in 2016, SVC completed a million dollar renovation to the Myrtle Johnston Lodge. The facility is available for public and private events, which provide a small amount of funding for upkeep but not enough to house a caretaker. Without a full-time staff presence, Camp Pollock would no longer be a safe and enjoyable space for families to experience the outdoors. The property would suffer, degrade, become unsafe, and could be unusable by the public. SVC would be left with the choice of closing the property or reassigning funds from other critical open spaces to save the camp. Either way, the public would lose a valuable piece of the Sacramento natural landscape. We are in contact with a few tiny house construction companies to find the best fit for our needs, and to use your donated dollars wisely. Thank you for helping us raise the funds to complete this exciting, much-needed project! Check out our project page on the rapidly growing Conserve With Us platform. Or make a donation through our secure online portal. Docents are the heart of SVC's outdoor programs. Each year, they teach and inspire thousands of visitors through guided hikes, runs, equestrian rides, mountain biking tours, service projects, campouts, and much more. Whether you're a returning lead docent or new to SVC and want to learn more about the program, please join us for this annual SVC Docent Training at Camp Pollock. All are welcome. New Year. New You. New Trails! Kick off the new year in your running shoes at Deer Creek Hills Preserve with SVC. Two new trails were recently marked (thanks to a generous grant from our friends at REI!) and are now open for trail running on Saturdays from 9am to 1pm, February through May. 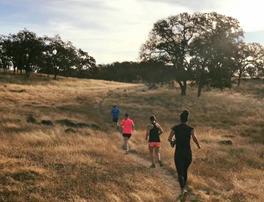 Bring a friend, your whole crew, or find your own pace solo among the rolling grassland and oak woodland. Be sure to pre-register. Join SVC Docents to celebrate the new year on horse back at Deer Creek Hills Preserve. This ride is through open country over a variety of terrain on a working cattle ranch. Climbing and descending hills and creek crossing are involved and trail riding experience is highly recommended. Space is limited to 20 riders and spots will fill quickly. Riders must provide their own horse and helmet. Want to make a difference and willing to get a little dirty? 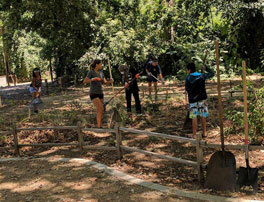 Join SVC Staff and Docents on select Saturdays each month (no longer every Saturday) from 9am to 1pm to improve Sacramento's historic Camp Pollock. Volunteers are critical to help accomplish much-needed maintenance, landscape and improvement projects on the 11-acre property. Volunteer groups are welcome. For the outdoor lovers on your list who have everything, we've got the perfect gift for history buffs, runners, wildflower-enthusiasts, birders, families and MORE! Gift an annual SVC Membership TODAY. Purchase your gift online through Monday, December 17th at $50 or more, and we’ll do the rest to ensure your beautiful gift card and a complimentary Season Pass reach your loved one by Christmas. You can even include a personalized note. 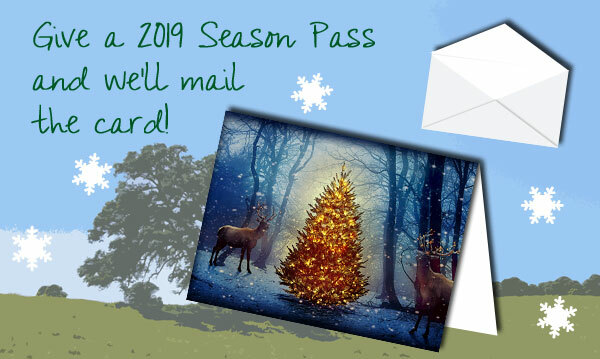 Season Passes are good for all docent-led outings (hikes, trail runs, equestrian rides and mountain bike tours) through December 31, 2019. A BIG THANK YOU to our sponsors, donors, and attendees for making this year's Treasures of the Valley a delightful night full of great music, delicious food and drink, and wonderful conversation! It was great to see our community come together at Camp Pollock to celebrate open space and help fund SVC's 2019 efforts. An extra special thank you to our top sponsors: Al and Christie Jahns, Law Office of Alfred F. Jahns, Murphy Austin Attorneys, Richland, and Vulcan Materials Company. Thank you to everyone who helped make this night a success, and to all who support SVC year-round. We are grateful to YOU this holiday season. We look forward to seeing you at our events in 2019! Tomorrow is #GivingTuesday — a global day of giving fueled by the power of social media and collaboration. #GivingTuesday connects diverse groups of individuals, communities and organizations around the world for one common purpose: to celebrate and encourage giving. Support the causes that mean the most to you, and amplify small acts of kindness. If providing future generations with healthy, natural landscapes is important to you, please consider making a donation to the Sacramento Valley Conservancy. SVC’s mission is to preserve the beauty, character and diversity of the Sacramento Valley. Through the support of our loyal members and institutional and corporate supporters (like you! ), the Conservancy grows every day to meet our community’s current needs, and to save land for future generations to enjoy. To date, more than 18,000 acres of open space have been protected by SVC in the greater Sacramento Valley region. Thank you for your continued support. If you are one of the millions of Americans who uses Amazon, remember to select the Sacramento Valley Conservancy as your Amazon Smile charity. Every time you shop, Amazon will donate to SVC. These donations help support the protection of farmland, wildlife habitat, and family hiking trails. It's a win-win: great stuff for you, and open space for all! Start the week off with an hour dedicated to grounding yourself in nature with yoga, join Summer Ward with Seasons Of Summer for YOGA at Camp Pollock every Monday evening from 6:00 to 7:30pm. Yoga will be on the deck when weather permits. Please bring your own mat, water and cash donations. All attendees will be required to sign a liability release to attend. This donation-based, seasonally-inspired class will support the preservation, restoration and outings of the Sacramento Valley Conservancy (recommended donation $10-$15). The Sacramento Valley Conservancy invites you to explore Deer Creek Hills Preserve on your mountain bike every Monday night July through October, 2018. The self-guided trail rides will be offered for 2-3 hours in the evening. Click here for more information or to register for a ride. SVC Staff would like to say THANK YOU to all of our amazing docents and guests that attended and helped at the 10th Annual Cowboy Breakfast this past Saturday. It was a wonderful time sharing the beautiful open spaces of Deer Creek Hills and enjoying each other's company with delicious pancakes, fruit, eggs and bacon. A special thanks to those who volunteered their time during the breakfast to help set-up, cook, lead hikes and rides, park cars, and register guests. We would not have had such a successful event without you! As the spring season comes to an end at Deer Creek Hills, don't miss your opportunity to enjoy the trails during the last Open Hike Day this Saturday, May 26th. Enjoy the delightful wildflower display all around the self-guided loop before the heat puts them to sleep for the summer. As the seasons change, keep an eye out on our calendar for upcoming events, such as the Monday Mountain Bike Rides from July through October. Thanks again for your continuing love and support. Sacramento Valley Conservancy would not be what it is today without all of you! Admission is free. The suggested $10 donation helps cover event costs. We'll have a photo booth, kid-friendly activities, live music from The Taylor Chicks, and the Lil Dis Lil Dat food truck. Participating organizations: California FFA Foundation, Girls in the Wilderness, PRO Youth and Families, Reading Partners, World of Powerful Youth, Sacramento Valley Conservancy, and WGS Homestylin's Lil Dis Lil Dat food truck. Don't forget to donate to your favorite nonprofits before midnight. Every dollar helps. A few generous SVC supporters have agreed to match the first $1,750 donated for Big Day of Giving! That means twice the funds for protecting open space, twice the resources for youth outdoor education, and twice the value of every dollar you give. There is no need to wait until Thursday. Take advantage of this opportunity to boost your donation by scheduling your gift right now. Then come on down to the river to celebrate on May 3rd and let us say thank you in person at Camp Pollock. Start at bigdayofgiving.org/sacramentovalleyconservancy to pledge your contribution, then mark your calendar for the May 3rd celebration concert at Camp Pollock! From left to right: Lucie Adams, Kelly Hopkins, Evan Griffiths, Aimee Rutledge. The Board of Directors of Sacramento Valley Conservancy (SVC) announces the appointment of Kelly Hopkins as the organization's new Executive Director. Hopkins joined the conservancy in 2010, and has most recently served as SVC's Communications and Marketing Director. "Protecting the Sacramento Valley's landscape in perpetuity is essential for the health of our community, our natural resources and wildlife," said Hopkins. "I'm excited to continue working with such a dedicated group of volunteers, stewards and supporters who have a shared passion for protecting our environment." For the last 27 years you have supported SVC as the leading organization preserving open space in the Sacramento area. With your support, our staff, board and volunteers will continue our long-standing commitment to care for the land in perpetuity. "The highest reward after working to build an organization and create change comes from passing that labor of love on to newly inspired and talented leaders," said Aimee Rutledge who is transitioning from 22 years as SVC Executive Director to Acquisition Director. "Our new leadership inspires me every day. Sacramento Valley Conservancy is blessed to benefit from their energy, and from all our supporters' efforts, to improve the Sacramento region for future generations." Hopkins has been with SVC for over 8 years. She grew up in Northern California where she spent her summers hiking, camping, sailing and exploring the Sierra, which instilled in her a passion for protecting the environment. After receiving her B.S. in Organizational Communication Studies from California State University Sacramento, Hopkins joined REI as the Outreach Coordinator where she worked to support community partners and organizations, including land trusts which led her to SVC. When she's not working, Kelly's favorite outdoor activities include cycling, running and adventuring with her family. Hopkins takes over for Aimee Rutledge, who is stepping down from her position as SVC's Executive Director, and will continue working with the Conservancy in her new role as Acquisition Director. Rutledge is "excited to focus on fulfilling SVC's land protection goals." She also serves as Vice President and California Program Manager of The Wilderness Land Trust, and Acquisitions staff at the California Tahoe Conservancy. The conservancy board and staff are also proud to announce Evan Griffiths in his new role as Stewardship Director. Evan has been with the conservancy since 2015. Previously Evan served as SVC's Camp Pollock Manager and Stewardship Manager. He holds a B.S. in Mathematics from California State University Long Beach and a Certificate in Field Ecology. Evan's interests include cycling, DIY projects, dogs, water science, and Geographic Information Systems (GIS). Griffiths has taken over for Lucie Adams as she has stepped down from her position as SVC Stewardship Director, and working in her new role as SVC's Stewardship Advisor. Lucie is looking forward to traveling and new adventures with family and friends. "It has been a privilege for me to work with dedicated volunteers, docents, landowners, ranchers and SVC staff to ensure the Sacramento Region maintains a legacy of open lands for all. I am thrilled that this good work will continue into the future by the talented and enthusiastic new staff." Our projects and events would not happen without fantastic volunteer support. We can help you find a way to invest your time in the Sacramento Valley Conservancy's outings and hikes on our beautiful properties. Join our amazing group of trained volunteers to help with our docent led-activities at Deer Creek Hills and Camp Pollock. No experience is necessary, just a desire to learn about the land and to share your knowledge with the public, we provide the training. 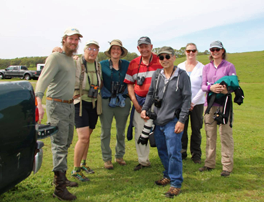 Birding, botany, geology and more! Docent training sessions are held in January and February each year. Contact Phred Strickland, SVC Program Assistant at outreach@sacramentovalleyconservancy.org for more information. Click on a time above to register. New docents and those wanting a more thorough review will attend from 9:00am - 11:00am. Current docents will have a refresher session from 11:00am - 1:00pm. Light snacks and coffee will be provided. For those who participated, thank you for attending the annual SVC docent training. We really appreciate you dedicating your time and efforts in support of making our activities at Camp Pollock and Deer Creeks Hills a fun, safe and enjoyable experience for all who visit our beautiful properties. We could not do it without the support of folks like you. For the past fifteen years David Scharlach has been an outstanding Docent for the Sacramento Valley Conservancy. He graciously shares his time, talents, and breadth of knowledge with hundreds of Deer Creek Hills visitors each year. The amazing history of California's early indigenous people, first settlers, the gold rush and so much more is preserved upon the extraordinary 4,500 acres of Deer Creek Hills. About 15 years ago, David Scharlach—then a local scout leader—came to the Sacramento Valley Conservancy to volunteer as a hiking docent. He had reviewed some initial public records and was struck by the significance of the essentially untouched property. Soon, learning about DCH and sharing with others what he discovered became a passion for David. He took research skills developed as an attorney and reviewed old law cases, assessor records, maps and old newsprint. He spread out into fostering friendships with knowledgeable archeologists and descendants of its early settlers and miners. He walked the ground with Native Americans, history professors and relevant authors. As his "history hikes" became popular, he was approached by some who had personal stories and remembrances to share. David continues to lead history hikes into the gold fields and sacred lands of the Nisenan Indians and delights in sharing "the rest of the story." Recently, he received recognition from the State Indian Museum as an Honorary Native American Docent. Step back in time and join us for the Deer Creek Gold Rush. Lead docent David Scharlach will guide us on a hike 3-miles long and a century and a half back in time as he retells the story of the search for gold at Deer Creek. Did you know that every time you shop on Amazon, The AmazonSmile Foundation will donate 0.5% of your purchase to Sacramento Valley Conservancy? Your Amazon shopping experience is the same, and you can watch the Amazon Donation dollars add up to protect precious resources in the greater Sacramento Valley. Help fulfill some of our highest needs, check out our WISHLIST of items. Our projects and events would not happen without fantastic volunteer support. We can help you find a way to invest your time in the Sacramento Valley Conservancy’s outings and hikes on our beautiful properties. Docent training sessions are held in January and February each year. Contact Phred Strickland, SVC Program Assistant at 916-612-3719 or email him at outreach@sacramentovalleyconservancy.org for more information. Our tentative schedule of Spring outings is in our latest newsletter. Subscribe to receive a printed copy at home or download a pdf. SVC joined American River Natural History Association's wildlife count with 'Team Meadowlark,’ in our first year of participating in the count. On Saturday December 2nd, our team covered the miles between Discovery Park and Camp Pollock. We documented 51 bird species, many squirrels, a mink, a coyote, 2 deer, a California sea lion, a river otter and more! The information collected is reported to eBird, ARNHA staff and the other teams along the parkway. All of the data will be available for scientists, students, and agency staff. View the full report. HUGE THANKS to the SVC volunteers and staff who contributed to the 2017 count! On #GivingTuesday, Facebook and the Bill & Melinda Gates Foundation will be matching up to $2 million of funds raised on Facebook for US nonprofits. Facebook is also waiving all fees for donations made to nonprofits on Facebook this #GivingTuesday. Every dollar you give to the Sacramento Valley Conservancy helps protect important resources in the Sacramento Valley for all of us. You can help protect family farms and ranches, land around lakes, rivers, streams and areas that allow for seasonal flooding, as well as large, connected natural areas for fish and wildlife. With your help we have already protected more than 17,600 acres in Sacramento, Yolo, Sutter, El Dorado and Placer counties. Commit to helping continued protection of precious land, air and water in your neighborhood. Join your community on November 28, 2017 for Giving Tuesday! Make the pledge! Share your pledge photos on Facebook and Instagram for a chance to win one of 3 SVC hats! Print, pose, post. Use the hashtags #givingtuesday #OpenSpace and tag us. Also, make sure your post is public, so we can find you. Share with your friends and family. Let them know you're giving where your heart is and encourage them to do the same. Or ask them to make a donation on your behalf instead of giving you a gift this year. Thank you for celebrating the 25th annual Treasures of the Valley fundraiser with us on Thursday Nov. 9 in the beautifully restored Myrtle Johnston Interpretive Center at Camp Pollock. Guests tasted the treasures of the Sacramento Valley, with local "farm to fork" fare sourced from farm and ranch lands protected in perpetuity by the Sacramento Valley Conservancy. A highlight of the night was Conscious Creamery's seasonal flavor of dairy free gelato. The pumpkin spice gelato was made fresh from seasonal squash grown on an SVC protected conservation easement, which serves as Swainson's Hawk foraging in Sloughhouse. Thanks to you and our community, the 2017 event was a huge success. Special thanks to the generous in-kind support from Hoppy Brewing Company, Bogle Vineyards, Grindstone Wines, Il Gioiello Winery and Morse Wines. Some of this year's silent auction items included native plants and trees from Sacramento Tree Foundation and Cornflower Farms, Disney tickets, Southwest tickets, and locally hand-made jewelry. All proceeds from the event benefit the Sacramento Valley Conservancyââ‚¬â„¢s work preserving the beauty, character, and diversity of the Sacramento landscape in Yolo, Sacramento, Sutter, Placer, Amador and El Dorado Counties. Thank you to each of our 250 attendees and all of our supporters! The Latrobe Fire, located near Latrobe Road and Scott Road in Sacramento County near Rancho Murieta, began on Wednesday, July 26, 2017 at 2:45pm burned through the south side of the Deer Creek Hills Preserve. A second fire, named by Cal Fire as the Largo fire, began Sunday July 30, 2017 at 1:45am on South Shingle Rd at Michigan Bar Rd, northeast of Rancho Murieta, also burned through Deer Creek Hills Preserve. The acreage of the two fires combined totaled 1,522 acres. The Sacramento Valley Conservancy lost 1,100 acres between the two fires, with an estimated 230 acres of oak woodland and 870 acres of grasslands burned. "It looks like a wasteland," said Fred Tracy, Sacramento Valley Conservancy Program Assistant. While these fires were primarily grass fires and did not burn high into the canopy, the closure of the south property will result in a loss in grazing revenues. SVC's annual agricultural revenue has taken a significant hit. Winter flooding on the conservancy's Elkhorn Basin Ranch resulted in half of the walnut trees dead or severely damaged. Damaged trees, paired with overly saturated grounds and inability to plant crops, combined with lost revenue from the wildfires, the conservancy is now down more than $200,000 in revenue for 2017. Every dollar and hour donated will make a difference in getting Deer Creek Hills back in shape for us all to enjoy again," said Aimee Rutledge, Executive Director. For both ecological and safety reasons, the conservancy will keep all outings and users off of the Deer Creek Hills south property for the remainder of the 2017 season. Once the burn area begins to recover SVC will conduct vegetation monitoring in order to track the recovery of the oak woodland and grasslands. Conservancy staff anticipate the fire damage will not drastically affect hiking activities which resume in October, however they will need help with rehabilitating fire breaks, restoring trails and trail markers, repairing over 5 miles of damaged fence-line and signs, and is asking the community for donations. Volunteers wishing to help can join a post-fire volunteer day scheduled for October 7, 2017 and donations can be made to the Deer Creek Hills South Fire Recovery Fund through www.sacramentovalleyconservancy.org. Deer Creek Hills Preserve is the largest open space preserve in Sacramento County. The 4,500 - acre property consists of Blue Oak Woodlands, seasonal creeks, and grasslands, and is a working cattle ranch. A network of winding trails and ranch roads allow visitors to explore the beauty and expanding views of the Sacramento Valley and the High Sierras. Starting at midnight on May 4th, the Sacramento region will come together for one Big Day of Giving -- a 24-hour giving challenge that lifts up lives and makes the Sacramento region a wonderful place. Since 2014, the giving day has united our community, raising more than $16 million for local nonprofits from over 36,000 donors from all over the region, the state, the country, and the world. Last year's day was challenged with technical issues, but the Sacramento Regional Community Foundation has changed platforms to CivicCore and we are ready to make 2017 our BEST Big Day ever! In 2016, with your support, we were the fortunate recipient of $19,695 from 89 unique donors. Your generosity makes all of the work we do possible! Land Conservation and Protection, Habitat Restoration, Youth, Education and Stewardship, and Environmental Recreation, through more than 100 Outings and Events offered this year is made possible through generous support from generous donors like you. This year we have set a goal to raise $30,000! Will you help us get there? Make your BIG Day of Giving donation NOW! Reviewed by YOUR Community Foundation! Sacramento Valley Conservancy now holds a new conservation easement protecting 1,000 acres of California tiger salamander and vernal pool habitat. Located north of Twin Cities Road and the 1,200-acre SMUD Nature Preserve, this newly protected area provides more area for salamanders to recover—they are a federal and state listed endangered species. SVC helps manage both preserves. SVC also holds other conservation easements and owns other preserves protecting in the nearby area, protecting vernal pools, oak woodlands and creeks, totaling over 7,700 acres. SVC continues to work with local landowners, public agencies, ranchers, developers, mining companies and other partners to protect many more thousands of acres of land to provide connected, protected landscapes where rare, native plants and animals can thrive. SVC protected our first 160-acre property in 1997. We have now protected a total of over 17,000 acres in the Sacramento Region. 24 hours to give to our region. Click here to donate to Sacramento Valley Conservancy's profile page on BigDayofGiving.org NOW! Come rest at Deer Creek Hills in green spring splendor surrounded by oaks and wildflowers after a relaxing bike ride on Scott Road free of traffic! In support of regional “2015 May is Bike Month,” Sacramento County, the Cities of Folsom and Rancho Cordova, and El Dorado County are closing portions of Scott Road, White Rock Road and Placerville Road to provide bicyclists and pedestrians with an opportunity to travel on stretches of road with no motor vehicle traffic. Access Locations, Parking & Detours: 1) Scott Road between the US-50/Scott Road Interchange and Latrobe Road; 2) Portions of Placerville Road; 3) White Rock Road from Luyung Drive (near Sunrise Boulevard) to the Sacramento County/El Dorado County line. These sections of roadway will be closed to all through vehicles. See map for access locations, parking areas and detours. Visit the Restore Camp Pollock site and share with friends! Join us for luxury camp food, star-gazing and great company and see SVC's newest acquisition--Camp Pollock. Enjoy sunset with us on 11 acres on the bank of the American River. Sacramento Valley Conservancy; PO Box 163351; Sacramento, CA 95816 ID 68-0256214 Thanks! Learn how donation of a conservation easement can help protect your land and save you money on your tax bill--maybe a lot of money for a long time. But, you must act now! Subaru/IMBA (International Mountain Biking Association) Trail Care Crew is partnering with Murieta Trail Stewards and the SVC to educate the community on building and designing sustainable trails. A classroom setting to take place in the morning hours, a complementary lunch offered and trail building will take place at nearby Deer Creek Hills Preserve on Saturday April 20th from 9-4pm. Join the excitement of trail building! The award-winning Subaru/IMBA Trail Crew will improve trails at Deer Creek Hills as one of only 60 stops nationwide in 2013. Click below for more information and how to register. See the below link to the recent Sacramento Bee article on this new SVC acquisition. Contact Aimee Rutledge, Executive Director, at 916-425-5879 to help with volunteer time or funds for repair of the 1924 lodge and grounds. Read all about and view photos and video of our February Geology Docent-Led Hike. Register for our self-guided trail, open every Saturday from 9am-1pm and for our upcoming Wildflower and Bird and History Docent-Led Hikes. And, don't forget the ever-popular Cowboy Breakfast, this year on Cinco de Mayo, May 5, with breakfast at the corral with SVC supporters and friends and a free Docent-Led hike for those who want to participate to burn off breakfast! Watch this wonderful video of beautiful scenes from next door to Deer Creek Hills at the Jonas Ranch in East Sacramento County. See weblink below or download attachment to see a gorgeous spread of Deer Creek Hills and a feature on Sacramento Valley Conservancy in the summer 2010 edition of "Saving Land" the main publication of the Land Trust Alliance. SVC is a long-time member of the Land Trust Alliance and is newly accredited by the Land Trust Alliance Accreditation Commission. The Land Trust Alliance saves the places people love by strengthening land conservation across America and represents more than 1,600 land trusts nationwide. Sacramento Valley Conservancy celebrates 20 years (1990-2010) of protecting our precious heritage land and water resources, local farms and ranches, and floodplain by offering special opportunities for you to see and share our preserves and success! Come enjoy beautiful spring weather, wildflowers, creeks and sunsets with us at our Cowboy Breakfast at Deer Creek Hills corral on May 1, our Twilight Wine and Cheese Celebration at our newest preserve along Deer Creek on May 7 and our Summer Social on June 17th. All events are free! See inside and back page for registration information. Your support makes our success possible. Dedicated and visionary local folks inspired to protect our special places for future generations founded the Conservancy in 1990. We started with a nine-member Board of Trustees, no staff, and no land protected. Today, we have a thirteen-member Board of Trustees, twenty-five member advisory council, seven staff members, over 1500 annual donors, over 100 annual volunteers and almost 11,000 acres of land protected. And, we are very proud to announce that we are one of only ten accredited land trusts by the Land Trust Alliance Accreditation Commission in California. SVC was also named the best small nonprofit in the six-county capital region in 2003. Thanks to you for making all this happen! During our first five years, we completed two land transactions. Over the course of the next 15 years, we completed 28 land transactions, and raised over $30 million in land acquisition funds. Our average land transaction takes over one year to complete, many take as long as three to seven years. All have had at least three funding partners. Deer Creek Hills involved over 15 institutional partners and over 300 community donors. Elkhorn Basin Ranch involved seven funding partners. You and future generations now own and have access to over 4400 acres of blue oak woodlands, creeks and cattle ranching land at the Deer Creek Hills Preserve. Project YES (Youth, Education and Stewardship) brings youth on day and overnight trips to the preserve. We also work with local farmers and ranchers on almost 7500 acres of land producing local rice, corn, walnuts, cattle and other crops. We manage these lands to maximize their habitat values and restore habitat in areas not viable for farming. These lands help sustain local farming, SVC and food, homes for wildlife and floodplain for us all. We cannot continue operating and accomplishing our mission without you and your support. Keep up your good work by supporting SVC! The Land Trust Accreditation Commission, an independent program of the Land Trust Alliance, announced on August 5, 2009 that Sacramento Valley Conservancy has been awarded accredited status. "Accredited land trusts meet national quality standards for protecting important natural places and working lands forever," said Commission Executive Director Tammara Van Ryn. "The accreditation seal lets the public know that the accredited land trust has undergone an extensive, external review of the governance and management of its organization and the systems and policies it uses to protect land." 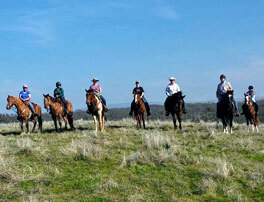 Deer Creek Hills and ranching operator, Lucky Seven Ranch, featured in Edible Sacramento article. To view article see below. See link below for Master Plan documents and Draft Environmental Impact Report. County Parks and Recreation Commission will hear public comments on Thursday, January 22 at 6pm at 700 H Street. Sacramento, CA (September 12, 2008)- The Sacramento Valley Conservancy (SVC), in collaboration with Yolo Land Trust, today announced that it successfully completed its purchase of the 1,682 acre Elkhorn Basin (aka Knaggs) Ranch in Yolo County. For the full press release, download the Word document below. SVC will hold the easement protecting the critical vernal pool habitat and manage the cattle grazing to benefit wildlife species. The 7-mile Howard Ranch Trail allows the public to access the SMUD Nature Preserve from Rancho Seco Park. See link below for a recent Channel 13 news piece by John Iander about SVC's ecologist Carol Witham conducting fairy and tadpole shrimp surveys. Second Half of Deer Creek Hills Purchase Complete Sacramento, Calif.
Three years after Sacramentans voted not to develop it and two years after launching an effort to acquire it, the Sacramento Valley Conservancy announced the successful purchase of the last 2008 acres of the Deer Creek Hills property, the final victory in the nonprofit organization's effort to preserve more than 4000 acres of oak woodlands and grasslands in East Sacramento. The Sacramento Valley Conservancy (SVC) was named the best non-profit with a budget under $750,000 in the six-county capital region by the "Models of Success" program, sponsored by the Sacramento Metro Chamber of Commerce and the Non-Profit Resource Center.